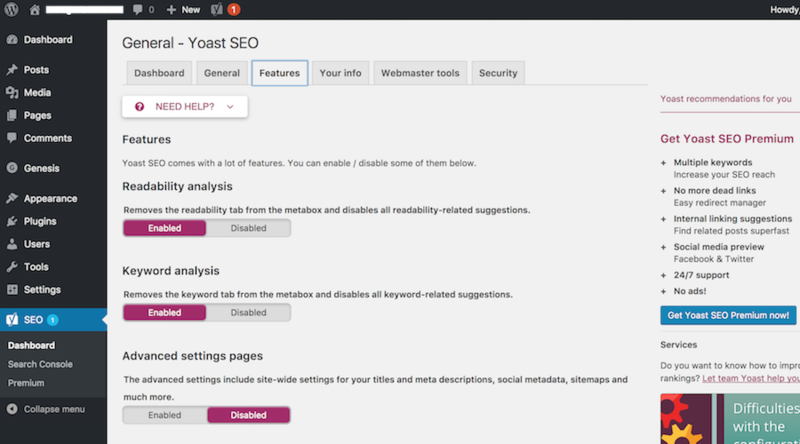 Before you launch your blog or start to write get these Yoast SEO plugin settings in order. It is quick and easy. Just follow the steps. 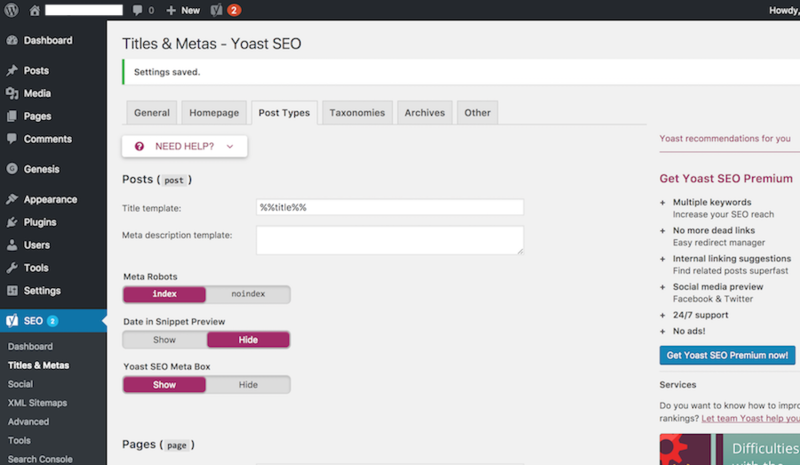 1) Click the Features tab of the Yoast SEO Dashboard. Select Enabled for Advanced settings pages and click Save changes. 2) Under Titles & Metas select the Homepage tab and enter your Homepage Title and Meta description. Click Save changes. 3) Select the Post Types tab. For Posts, Pages and Media I delete everything but %%title%%. 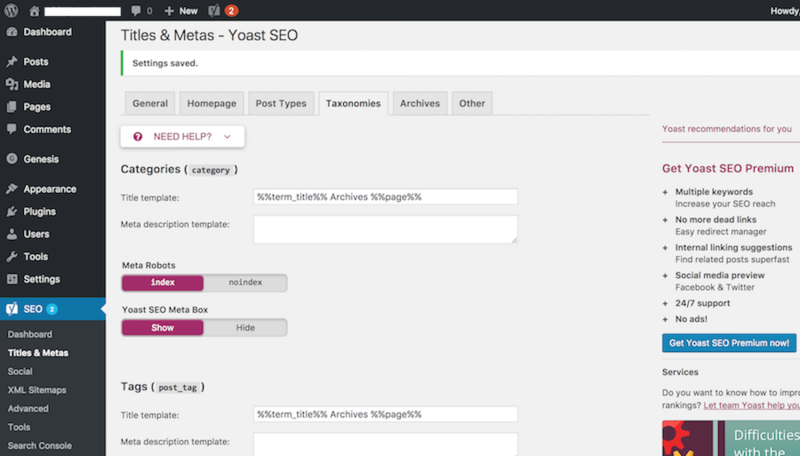 This will automatically enter your article headlines as the SEO Title in the Yoast settings. If you think that you will use pagination on articles you could keep %%page%%. I do not. The %%sep%% %%sitename%% part simply adds – Your Site Name to the end of your SEO Titles. I do not add my site name or domain name to my SEO Titles (title tags) because I think they dilute their power. 4) Select the Taxonomies tab. For Categories and Tags I recommend to delete everything but %%term_title%% Archives %%page%% for the same reasons mentioned in the last step. Click Save changes. 5) Select the Archives tab. Change Author archives and Date archives to Disabled. Click Save changes. This will prevent duplicate content showing on your site. 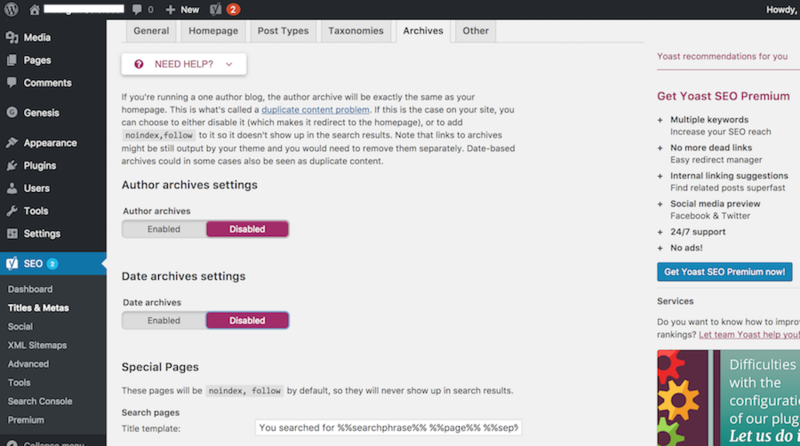 If you have several authors working on your website you could keep the Author archives enabled. However, I would recommend blocking search engines from indexing these pages with your robots.txt file. 6) Select the Other tab. For subpages of archives, change to noindex. Disable meta keywords tag. It does not influence your search engine rankings. Click Save changes. 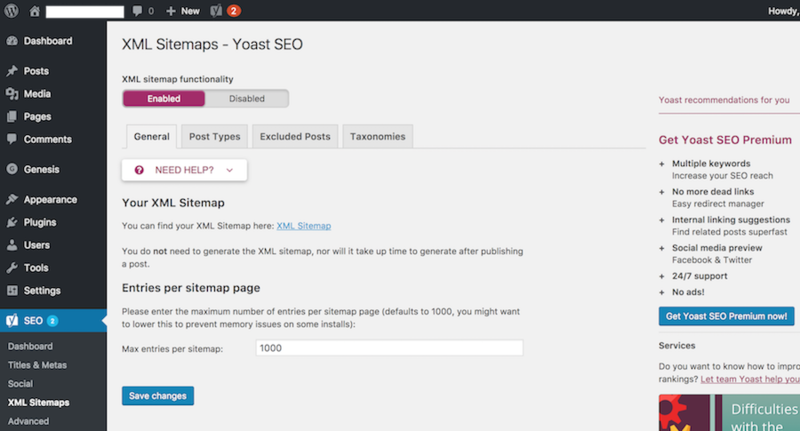 Submit your XML sitemap in Google Search Console. 8) Navigate to Advanced and select the Permalinks tab. Use the settings you see below and Save changes. The important one is to strip the category base (usually /category/) from the category URL. Shorter URLs are best. 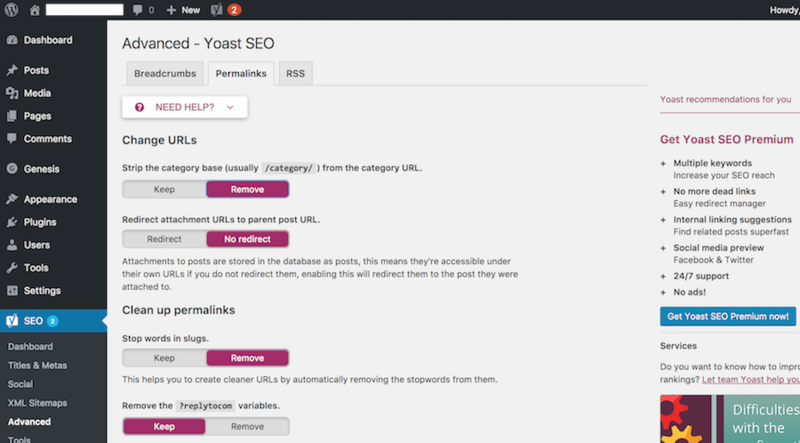 Your basic Yoast SEO plugin settings are complete. Learn more about key settings in our how to start a blog on WordPress article.